I recently stayed at Outrigger Waikiki on the Beach for three nights to cover the 12th annual Spam Jam, an event that celebrates Hawaii’s beloved Spam and continues to grow in scope. On my first day at Outrigger Waikiki, I was able to explore the hotel, as well as take a walk around the neighborhood, before meeting up with Nancy Daniels, the director of public relations for Outrigger Enterprises Group. I stayed in one of Outrigger Waikiki’s 497 guest rooms. My room had a view of the Waikiki streets below on the left, and the beach and ocean on the right. It came complete with a queen bed, free Wi-Fi, complimentary calls to the continental United States and Canada, in-room coffee and tea, and in-room dining service. Outrigger Waikiki also has a 24-hour fitness center, a 24-hour business center, the Waikiki Plantation Spa, on-site shopping, three restaurants, a sandwich shop and a coffee bar, while having the privilege of being one of seven true beachfront properties. The Waikiki Plantation Spa has a variety of massages, facials and body treatments, as well as waxing, manicures and pedicures. Outrigger Waikiki was offering coupons to the spa for guests while I was there, as well as discounts at shops and restaurants. Waikiki is a neighborhood within Honolulu County, but you may as well call Waikiki a beach city in itself. It’s a bustling area, aided by the Waikiki Beach Walk (more on that later) and a vast assortment of shops, restaurants and eateries. It’s about 1.5 miles from Hawaii Prince Hotel Waikiki to Aston Waikiki Beachside Hotel (about a 30-minute walk), which are on the north and south sides of Waikiki, respectively. You can either meander around the popular and busy Kalakaua Avenue or walk along the beach while people gaze out at the vast ocean (FYI, you can wade far out into the water at Waikiki Beach because the water is so shallow near the beachfront). The beachfront was packed when I was there, from the beach area to the welcoming waters. I met Daniels in front of the popular Yard House eatery on the Beach Walk, an eight-acre spread along Lewers Street boasting more than 50 options for shopping and dining, the brainchild of Outrigger President and CEO David Carey that was developed in 2007 in partnership with American Assets Trust (American Assets Trust now owns the Beach Walk and Outrigger manages it). 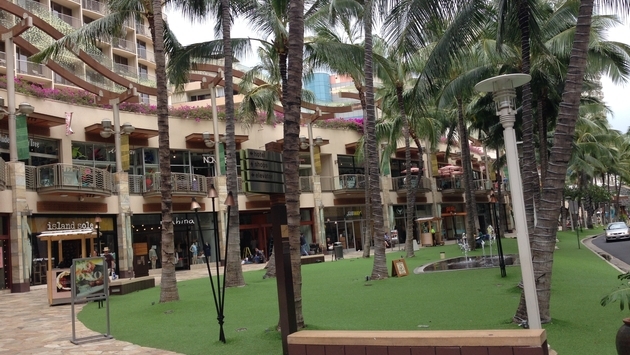 The Beach Walk—an open-air, two-level plaza—really has opened up the area of Waikiki, which used to be jam-packed and more suffocating than relaxing. A nice touch is a spacious lawn area boasting a platform that is a kids’ play area during the day (it shoots streams of water up from the ground), and a stage for live music at night. One of the properties that Outrigger manages on the Beach Walk is Hokulani Waikiki (by Hilton Grand Vacations Club), which caught my eye right from the start. The interior design of Hokulani Waikiki (via Los Angeles-based Indidesign) is a defining feature for the property. Hokulani Waikiki is sleek and stylish, but not overdone (similar to a lounge). It incorporates natural elements into its design, including water (water walls), fire (urns suspend from the display pool) and plants (spread across its walls). The property has 143 one-bedroom suites (prime bachelor pad/businessperson territory), each ranging from 545 to 575 square feet. Each suite includes a king bed; a living area with a sleeper sofa and an integrated flat screen TV and gaming system; a lanai or balcony (the one I was shown overlooked the display pool and the bustling Beach Walk); a boutique kitchen with a two-burner cook top, a microwave, a refrigerator, a dishwasher and a Tassimo espresso maker; and a spacious bathroom with a soaking tub, a separate shower, a toilet with a traditional bidet function and (my favorite) an LCD TV screen built into the mirror (the future has truly arrived). Oh yeah, one more thing: Hokulani Waikiki also has a rooftop, open-air pool bar called Na Lani Sky Lounge. It boasts a plunge pool, lounge seating, an intimate bar area, six complimentary private cabanas (each with a flat screen TV, a mini fridge and sofa seating), a hot tub, outdoor rain showers and great views of the surrounding area. Na Lani Sky Lounge is currently the only rooftop pool bar in Waikiki (although more are coming soon). I was very impressed with Hokulani Waikiki. To put it simply, you feel cool just being there. 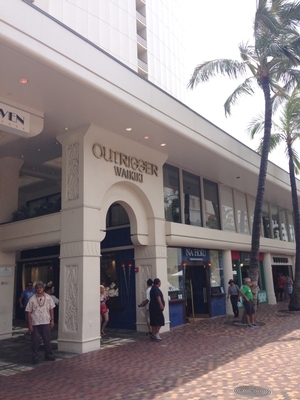 In Oahu, Outrigger also owns or operates Outrigger Reef on the Beach, Outrigger Waikiki Shore, Outrigger Regency on Beachwalk, Embassy Suites-Waikiki Beach Walk, Holiday Inn Waikiki Beachcomber Resort, OHANA Waikiki East, OHANA Waikiki West, OHANA Waikiki Malia, Ala Moana Hotel and Airport Honolulu Hotel. Outrigger Reef has an open feel to it, complete with an open-air lobby area featuring Polynesian canoe art, a swimming pool and pool deck and the popular Kani Ka Pila Grille, which showcases a weekly lineup of well-known Hawaiian musicians. On top of that, Outrigger Reef boasts the 5,000-square-foot Serenity Spa Hawaii, free Wi-Fi for guests, the Outrigger Activities Center and more than 2,500 square feet of event space. 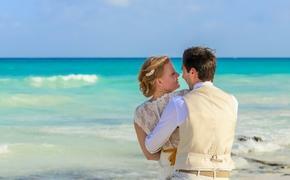 Outrigger also partners with Wyndham Vacation Ownership. Members of Outrigger Resort Club receive exclusive access and priority reservations at CLUB WYNDHAM Plus Hawaii resorts, including Wyndham at Waikiki Beach Walk. Note: I will be coming out with a first-hand account of the 12th annual Spam Jam soon.